Some guy you've never heard of is running to represent Kansas in the U.S. Senate. Attorney of Shawnee County. He's a Democrat. Today is his 40th birthday, and his campaign exploratory committee announcement in press release form is one of the most ridiculous things you'll read today. DA Chad Taylor has announced that his exploratory campaign for United States Senate has officially begun. Today, on his fortieth birthday, Taylor said "I am proud to be a Kansan.We have the people, talent, tenacity and character that are truly the core of this country. The people of Kansas aren't the problem - the career politicians that represent us in Washington are the problem. If we continue to elect the same people repeatedly to represent us, why would we expect Washington to change? It's time for Kansas to have an advocate, rather than an opponent, as our voice in the U.S. Senate." 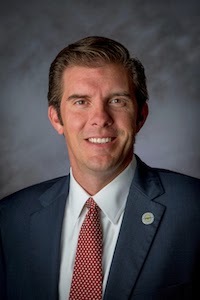 Taylor currently serves as the District Attorney for the Third Judicial District of Kansas (Shawnee County), where he was first elected in 2008 by almost sixty percent of the vote, and re-elected without opposition in 2012. D.A. Taylor's campaign plans include a series of listening tours across the state and a focus on feedback from all Kansans. When asked about his motivation to run for Senate, Taylor replied, "As an elected District Attorney, I am appalled by the behavior in Washington. A vote in the ballot box is essentially a vote of confidence that the person elected will do what is in our best interest. It causes me tremendous concern to see long time Beltway insiders putting their own political agenda ahead of doing what is right for the people of our state. As a Democrat D.A., I work closely with Republican Chiefs of Police, Sheriffs, state legislators and community leaders. Not once have we ever filibustered about doing the right thing. I've been asked repeatedly to consider running for statewide office; given the recent reprehensible behavior of Congress, the public support for this Senate campaign has become insistent. conversation on Facebook at facebook.com/Taylor4Kansas or @TaylorForKansas on Twitter. This is our opportunity to ensure that the rights and interests of Kansans are actually protected in DC. Let's show Washington that this is our Kansas." He has a website. Kind of. And a dream, I guess, but he doesn't stand a chance.